Yesterday, Zambia’s Ambassador to South Africa announced that President Lungu had summoned SA opposition leaders, Mmusi Maimane and Julius Malema, to meet him while he was at the SADC summit in Johannesburg. It was something about the President wanting to speak to them about their interference in our sovereign matters when they called for HH’s release. Like most people, I was shocked at that report. Why would anyone go looking for trouble for the President like that? Well, predictably, the two SA politicians rejected the invitation to meet the President. And again, predictably, the two jumped at the opportunity provided them by the President’s own diplomatic team to insult him for imagining he could summon them. The two of course did not fail to also say what they thought about the President generally. As if that debacle was not enough, by end of day, videos of PF cadres in full party regalia clashing with protestors from other countries, were doing the rounds. 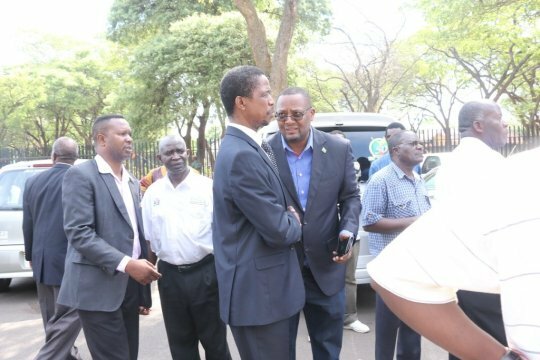 The protestors who had listed President Lungu among the presidents whose “dictatorial tendencies” they were calling for an end to also took their chance to hurl insults at the president as they demanded that the PF cadres leave. In short, Emmanuel Mwamba managed to turn the SADC Summit into a veritable dog’s dinner as a diplomatic context. He seems to have totally lost the plot and is repeatedly calling unflattering attention to the President whose image it is his job to build. As for the President himself, surely he knows that Emmanuel is no diplomat. Emmanuel’s real interest seems to be in hard knuckle party politics. So why keep him in the diplomatic service? I honestly think Emmanuel should lose his job for the disaster he created yesterday but then I know that this President does not fire people who beg to be fired. In fact he promotes them. But that is his presidential mandate. What the President can do with Emmanuel if he can’t bear to be without his ability to rubble rouse for him, is move him back home into a position in which he can engage in that acrimonious politics he seems to enjoy. Then there is the Minister of Foreign Affairs, Harry Kalaba. I have to ask, how did he allow all that yesterday to be even thought of, forget implemented? How did having cadres protesting their support for the President at an International summit in a foreign country seem even mildly rational? How could Emmanuel be allowed to provoke someone with as little restraint as Julius Malema? Simply, is the Minister of Foreign Affairs even in control of what is happening in the SA mission? Did Emmanuel run his little plan by Harry and he said yes, that is clever? Let me just end by advising President Lungu – you need to take a step back and critically look at your presidency. You are President of Zambia and not a candidate in an unending contestation for power. Your obsession with 2021, is allowing you to be led by people like Emmanuel who themselves are thinking of nothing but how they can get themselves into the political positions they really want. My sense is you need to completely change your inner team. They are driving you so off track we can all see you heading into a mighty crash over the abyss. Look at it this way, everything awkward that is happening around your presidency is well predicted by all neutral observers well before it does. It seems everybody knows which puddle you are about to step into except your advisors. In short, they are not earning their cushy salaries. Worse than that, they are turning you into a laughing stock. Change them – for your own good.